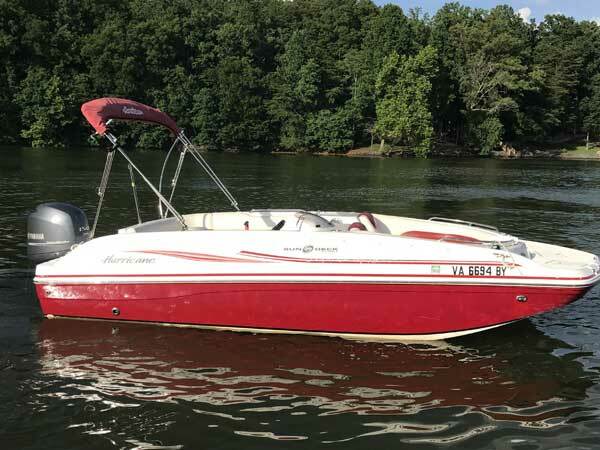 The Red Fun Deck boat is a 19 foot deck boat. It has a 150 hp Yamaha motor and a bimini top for hot and sunny days. It is spacious enough to accommodate 6 to 8 people, making it ideal for small families or couples, who enjoy water sports or fishing! This boat has a stereo that you can enjoy listening to while cruising the lake. The Azure Deck Boat is a 19 foot boat. It is equipped with a 150 hp Yamaha motor and a bimini top for shade. This spacious boat accommodates 6 to 8 people. 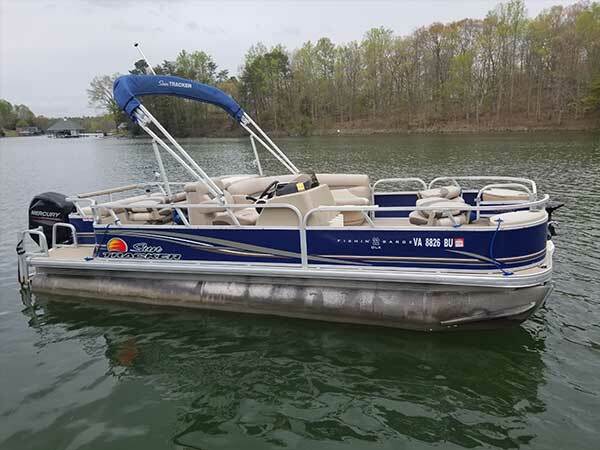 It is a fun way to enjoy your day by cruising the lake and listening to your favorite songs on the boat’s stereo system. The Fun Deck boat is a 19 foot deck boat. It has a 150 hp Yamaha motor and a bimini top for hot and sunny days. It is spacious enough to accommodate 6 to 8 people, making it ideal for small families or couples, who enjoy water sports or fishing! This boat has a stereo that you can enjoy listening to while cruising the lake. 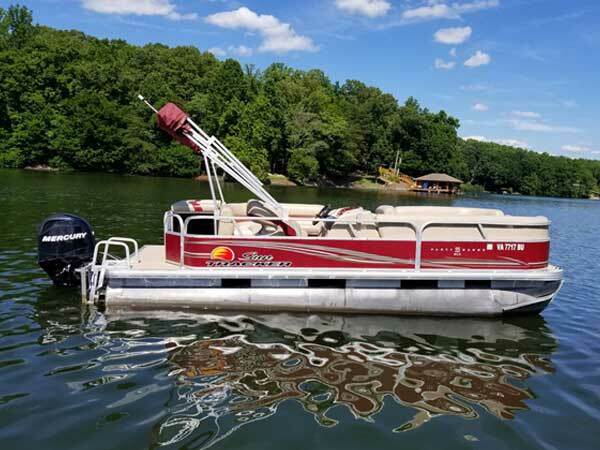 This Sun Chaser Pontoon is 24 foot in length, which gives you plenty of room for family and friends. 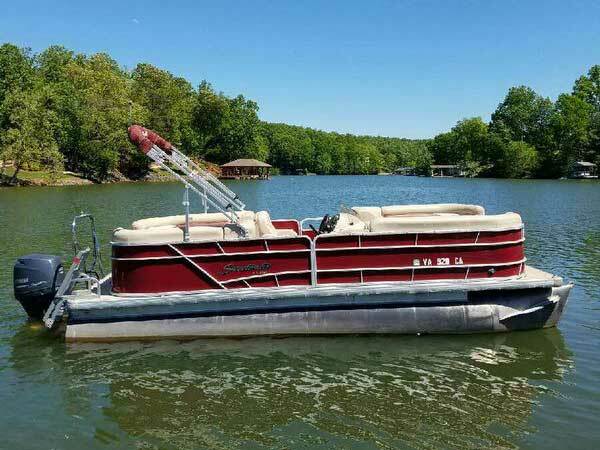 The pontoon has a 10-12 person capacity, with plenty of space for coolers and pool bags. The 90hp Yamaha 4-stroke motor makes this a super boat for cruising the lake, sight-seeing and relaxing. When you stop for a refreshing swim, this boat has a mounted swim ladder that makes it easy to get back into the boat. This boat has an auxiliary and USB hook-up to enjoy your favorite songs. 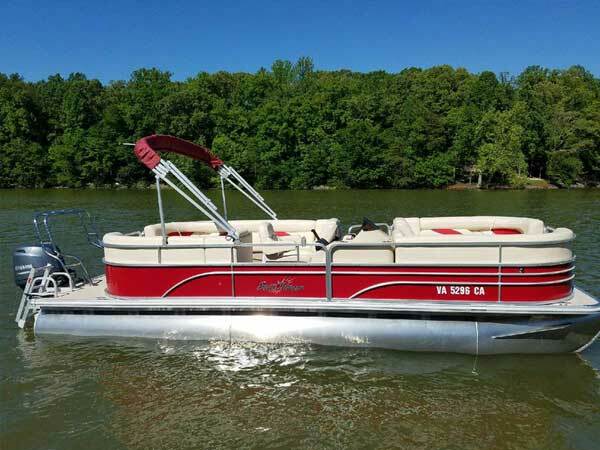 The Sweetwater Pontoon is a 24 foot boat, which gives you plenty of room for family and friends. The pontoon has a 10-12 person capacity, with plenty of space for coolers and pool bags. The 90hp Yamaha 4-stroke motor makes this a super boat for cruising the lake, sight-seeing and relaxing. This boat has plush seating and is comfortable for relaxing and lounging. Our Sun Tracker pontoon is a 24 foot boat, which gives you plenty of room for lounging. There are lots of storage for your cooler and bags. It is equipped with a 90hp Yamaha 4-stroke motor and a bimini top for shade. 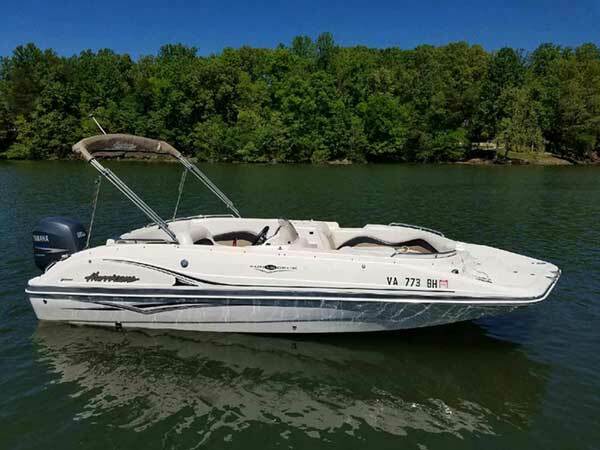 This boat is made to cruise around the lake while enjoying all that Smith Mountain Lake has to offer. It has a stereo system to enjoy your favorite types of music. Our 23 foot spacious Sun Tracker fishing pontoon accommodates up to 8 people. 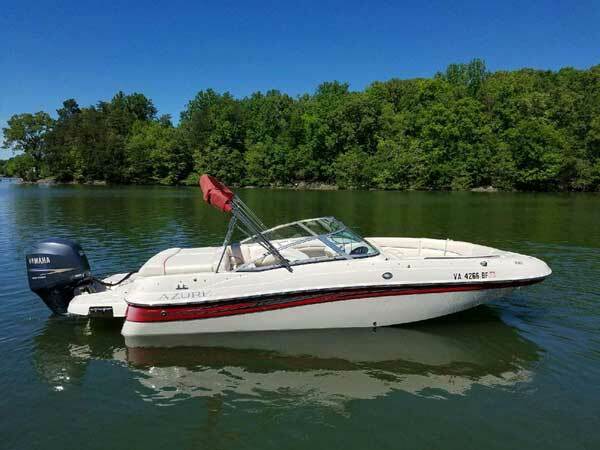 It is equipped with a 90hp Mercury 4-stroke motor, a bimini top that protcts you from inclement weather, top of the line Garmin fish finder, rod holders, trolling motor, and a radio for your favorite tunes. This boat is a fish machine. Our orange and black 2018, three seater Kawasaki jet-ski is very spacious for multiple riders. There is room under the hull to put items to ensure that they do not get wet! This jet-ski is a very smooth ride and fun for all ages. 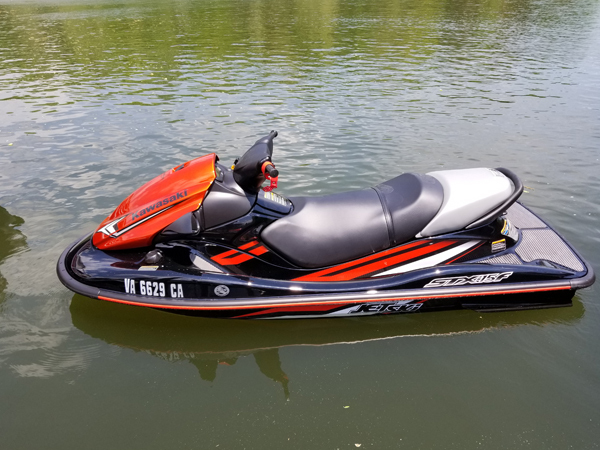 Our orange and black 2018, three seater Kawasaki jet-ski is a fun way to spend the day on Smith Mountain Lake! This jet-ski is very spacious and is fun for all ages. Also, this jet-ski has a "wet" proof storage to ensure that your items stay dry throughout the day.